North America’s desert Southwest orth America’s desert Southwest has attracted adventurers for has attracted adventurers for centuries and gear heads for centuries and gear heads for decades. The early 1960s spawned decades. 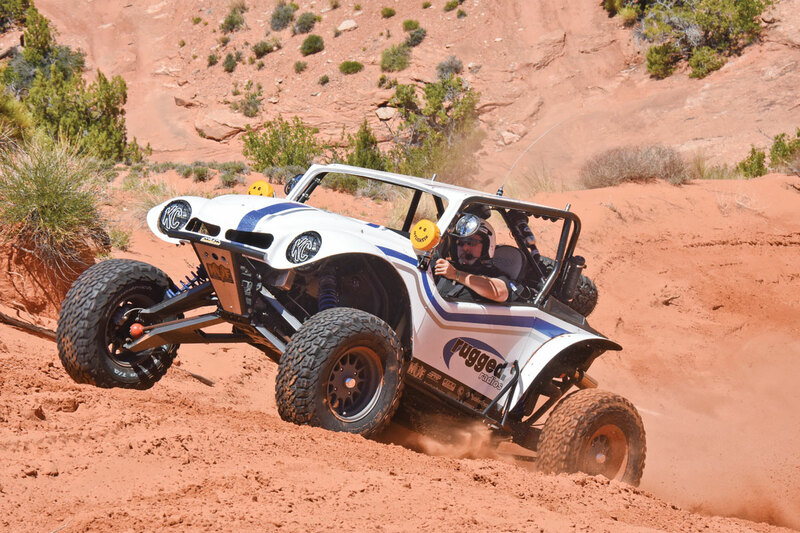 The early 1960s spawned the off-road vehicle (OHV) invasion the off-road vehicle (OHV) invasion that eventually brought us to extreme sport UTVs like the Polaris RZR XP 1000 and XP Turbo. Gear heads stripped down every imaginable type of street vehicle—from muscle cars, 4x4s and trucks to VW vans and Beetles—to create off-road vehicles (OHVs) for the dunes and desert. The Volkswagen Beetle became legendary for builders and racers, serving as the base for Meyers Manx dune buggies, Baja Bugs, all sorts of sand rails and what eventually became Class 11 in all sorts of desert-racing series. Baja Bugs stripped away fenders and the “hoods” of the rear-engined VWs for performance exhausts, larger tires and long-travel suspension. While the Rugged Radios Baja RZR looks just like an old 2WD Baja Bug, its Polaris on-demand 4WD and 175-horsepower turbo output let you tackle the steepest dunes without carrying a shovel, even with all-terrain tires. These iconic OHVs were used to lay out the first Mint 400 course and conquer the Baja Peninsula. Many gear heads caught the off-road bug in a Baja Bug or equivalent. 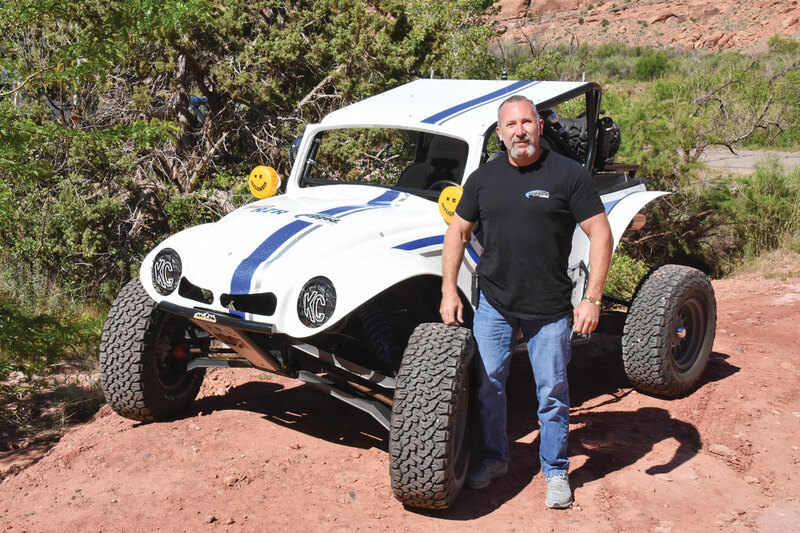 Greg Cottrell developed his love for VW Bugs early, as his dad raced Class 11 in the Mexican 1000, and the OHV bug led him to a career in the race communications industry as owner of Rugged Radios. 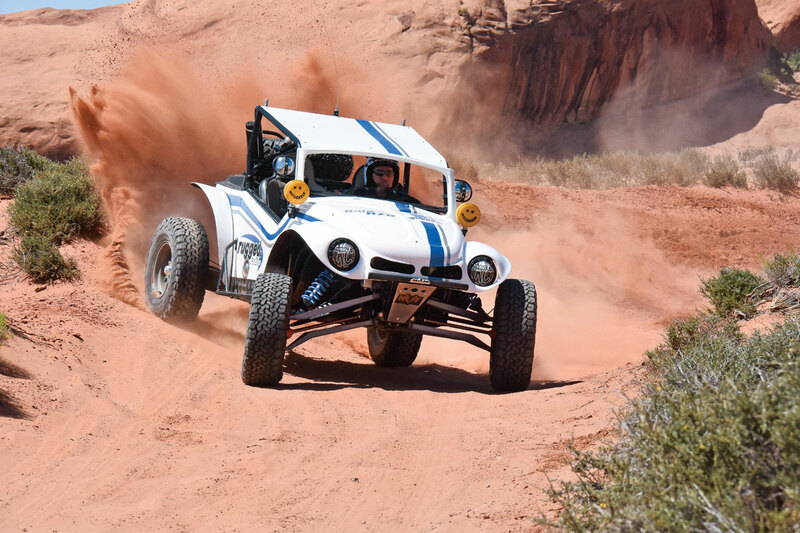 He has been an innovator in race radios for many years, so he decided to bring the Baja Bug back to life with another iconic rear engine OHV, the 2015 Polaris RZR 1000. Greg had NV Fab of Pismo Beach fame lay a custom fiberglass VW Beetle body on top of the XP1K to create a one-off show-stopper for last year’s Sand Sports Super Show. 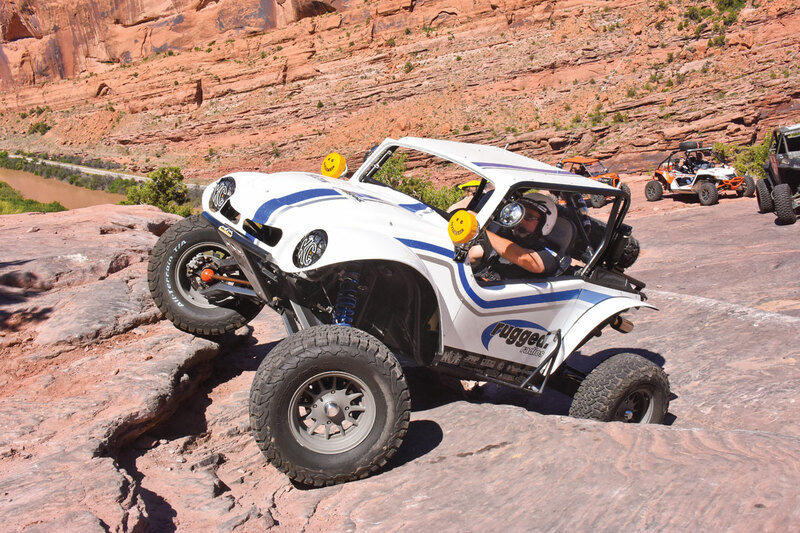 We got a chance to check out the Rugged Radios Baja RZR at last month’s Rally on the Rocks on a sponsored ride to the top of the Moab Rim trail. Built as a sand duner, the Baja RZR showed its rock-crawling prowess fitted with 31×10.5R15 BFG Baja tires on American Racing rims instead of Desert Trak custom paddles on Fullerton Sand Sports wheels. Here’s the scoop on the Rugged Radios retro RZR. Stripped of all body plastics, the 2015 RZR XP 1000 got a customized factory VW fiberglass dash and fiberglass front end complete with headlights and vents for the RZR radiator. Then the build got a custom Boondockers cage, integrated bumper/ spare-tire mount and aluminum doors, a roof, and shorty rear fenders by NV a roof, and shorty rear fenders by NV Fab. Crocketts Premier Auto Body Fab. Crocketts Premier Auto Body of Arroyo Grande, California, did the of Arroyo Grande, California, did the white paint, and Linson Signs of San Luis Obispo did the Baja RZR wrap. Since this was a historical build, KC Hilites had to be the lights of choice for the headlights, and the KC Daylighter A-pillar lights sit below the Assault Industries side mirrors. PRP went south of the border for the Mexican blanket inserts for the custom Grand Prix seats (from $389 each), and extra safety is added with PRP’s 5.2 harnesses ($129 each). Padded interior panels on the doors increase comfort and reduce noise. 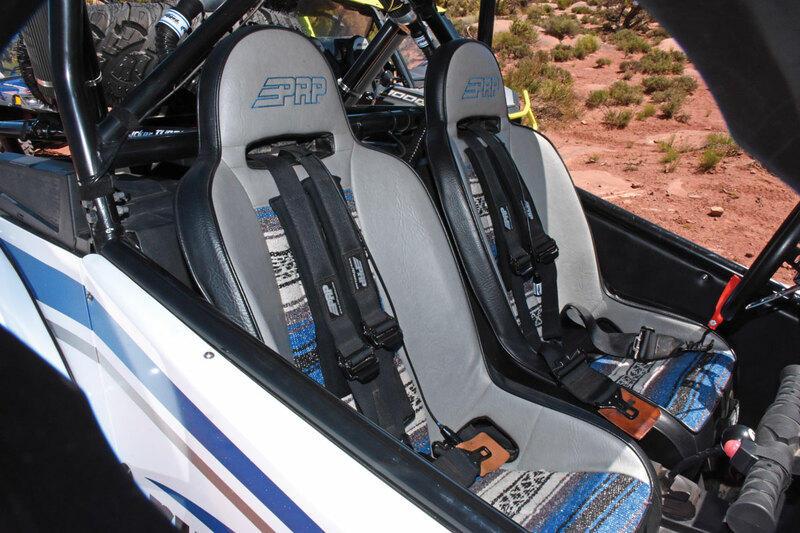 Inside, the Baja RZR build got the old-school treatment with a Baja-style chrome steering wheel and eight ball shifter, custom-stitched Mexican blanket PRP seats and PRP four-point 5.2 harnesses. Of course, the Baja RZR was tricked out with Rugged Radio’s RRP6100 Race intercom system with a 50-watt radio. The $629.10 RRP6100 is a two-place intercom with dual 3.5-watt amplifiers and independent volume controls, plus rear interfaces to a satellite phone, smartphone, GPS, XM radio and action camera. Also, the intercom has a switchable side-tone to eliminate background noise and Driver Isolate, which switches all radio communications to the co-pilot so the driver can concentrate on racing. It works with any handheld or off-road race radio and pre-wired helmets. 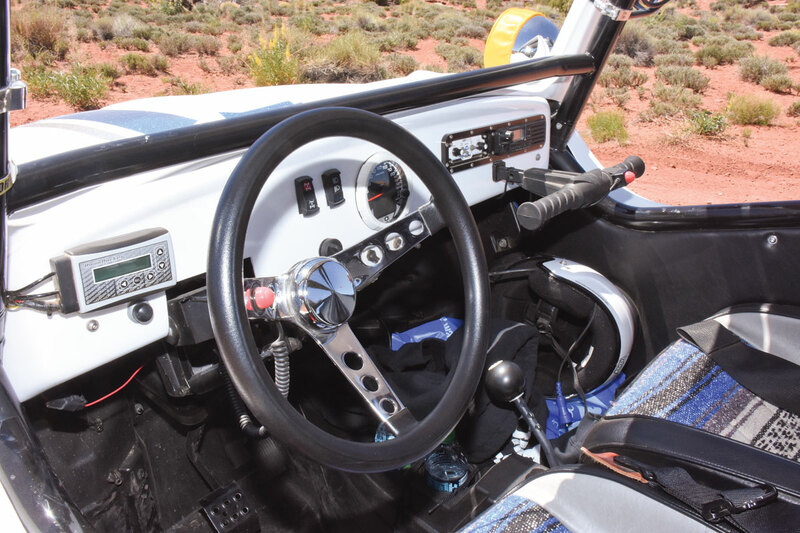 Even the dash looks old-school Baja Bug, but it’s equipped with the latest in race communications, audio and on-the-fly tuning for the 175-horsepower Turbo engine. The RZR speedometer completes the look. 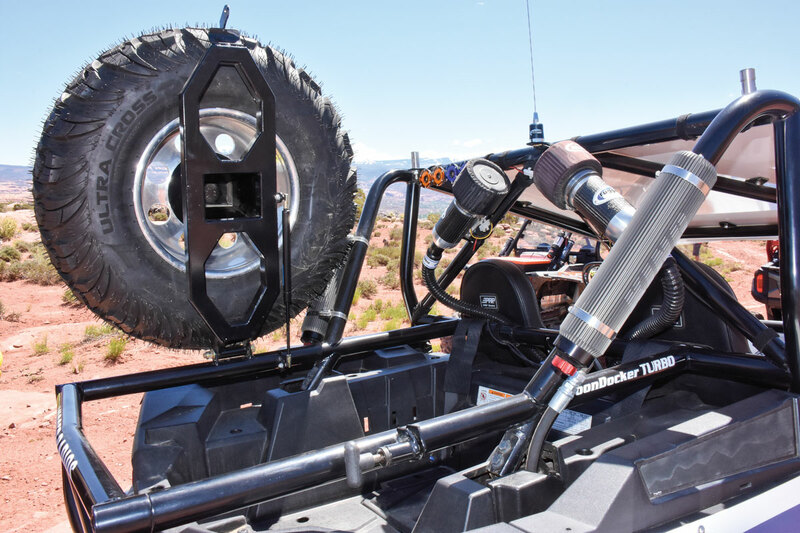 The Baja RZR also got Rugged Radios’ dual MAC1 carbon fiber air pumper system ($300 or $325 for four persons). For SCORE legality, four of KC’s 2.2-inch LED single lights ($30.91 each) are fitted to the rear cage for safety in heavy dust. Rockford-Fosgate makes audio systems for RZRs, and Greg added a Rugged Radios WM1 Bluetooth wireless music interface ($90). Boondocker also did the custom cage with integrated rear bumper and spare-tire mount with lift assist. Fluted reservoirs on the King Racing shocks carry more shock fluid and keep the fluid cooler for more consistent damping. Baja Bugs were never “all show and no go,” so the Baja RZR build had to have serious power and suspension. Boondocker’s RZR XP1K Turbo kit starts at $5,795 with a Garrett GT2860 turbocharger that has a 60mm billet compressor wheel and uses the OEM airbox and filter. The kit makes 175 horsepower, and Boondocker also has forged 9.5:1 pistons ($524), Carrillo H-beam connecting rods ($598), head studs, ($185), a worm-style cam-chain tensioner ($199), a low-compression head gasket ($51.73), billet throttle body adapters ($239.95), and a Big Radiator kit ($450). Cottrell also used Boondocker’s Turbo Control Box ($918.13), which allows complete driver control of boost and the EFI fuel system. The waterproof control box automatically compensates for altitude. automatically compensates for altitude. The Turbo breathes through a Gibson The Turbo breathes through a Gibson dual exhaust and sounds sweet! 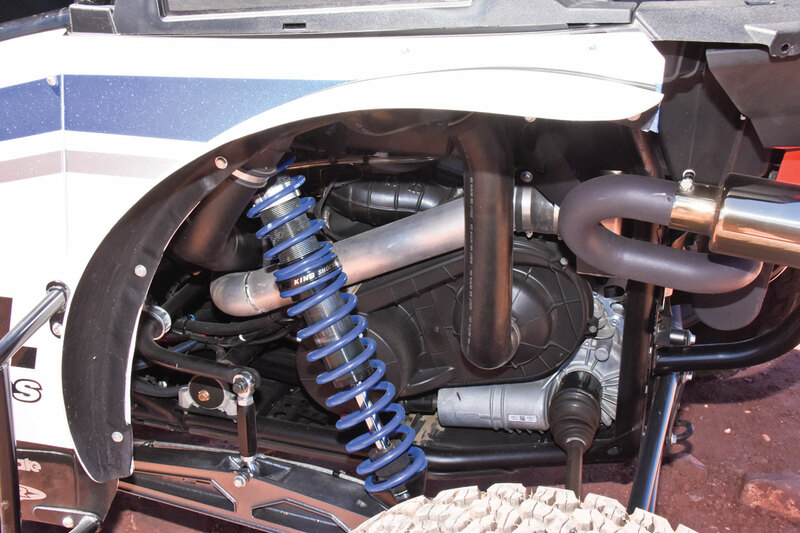 With larger lungs, the Baja RZR needed longer legs to match. Greg went to HCR Racing for its $7999 Long-Travel Suspension (LTS) kit with 4-inch-over boxed arms that add 3 inches of wheelbase. He used King Race Series 2.5 remote-reservoir shocks and RCV 4340 chromoly axles. The LTS kit increases travel to 21 inches for gobbling Baja whoops, dune landings and Moab rock monoliths. RCV 4340 chromoly axles handle the extra torsional forces between the Boondocker Turbo and 31-inch BFG Baja all-terrain tires in high-traction, low-speed rock crawling or low-traction, high-speed dune jumping. While the look of the Baja RZR is retro, few would want to tackle the desert in an antique VW Beetle. The Rugged Radios Baja RZR is all business and cutting-edge performance under that fiberglass skin. With 175 turbocharged horsepower, more than 20 inches of travel with next-level King shocks, super-comfortable PRP seats and harnesses, high-tech LED lighting, and crystal-clear communications, the Rugged Radios RZR is an epic ride for Pismo dunes, Moab slick rock and high-speed desert like Nevada’s Mint 400 course. Throw on a roof rack and it’s ready for Rip to Cabo’s Tip and back. 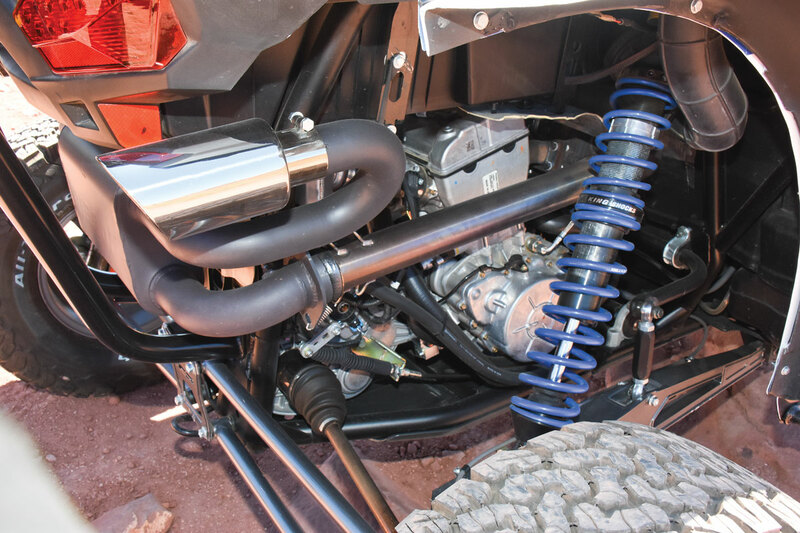 A true sleeper, the Baja RZR hides its Garrett GT2860 turbocharger, but the aluminum intercooler tubing gives it away to the keen eye. Long-travel suspension with King dual-spring shocks deliver a magiccarpet ride. Dragonfire introduces more electrical power for your machine!